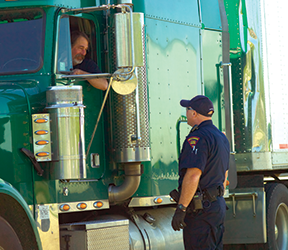 When a driver pulls up to a weigh station for a roadside inspection, officers will use enforcement bulletins and other procedures produced by the Commercial Vehicle Safety Alliance (CVSA) to ensure regulations are enforced consistently between jurisdictions. CVSA’s enforcement bulletin on the Medical Examiner’s Certificate Integration with the Commercial Driver’s License (CDL) specifies certain actions on the part of the officer depending on the circumstances. This inspection bulletin specifically addresses the CDL and commercial learner’s permit (CLP) as they relate to the medical status being tied to the license. Nlets, a network of state, local, and federal law enforcement, justice, and public safety agencies. The agencies share and exchange critical information. If the report indicates the driver is medically qualified, this satisfies Section 391.41(a)(1), and the CDL or CLP holder may operate any kind of commercial motor vehicle (CMV), CDL and non-CDL alike. Note that a non-CDL driver must carry a copy of the medical card since the SDLA are not monitoring the driver’s medical status. If the driver has a downgraded license and is carrying a current medical card — but claims he or she submitted a medical certificate to the state — the driver must work with the licensing state to get it straightened out. The CDL is not currently active based on the driver report, and enforcement is bound by the official record. Keep up-to-date on the latest in security and motor carrier safety risk management. Click here to take a free trial of the Transport Safety Risk Management & Security Newsletter.